Best cheap hardware to run Nextcloud on? Cost seems to be $111 (not including RAM). 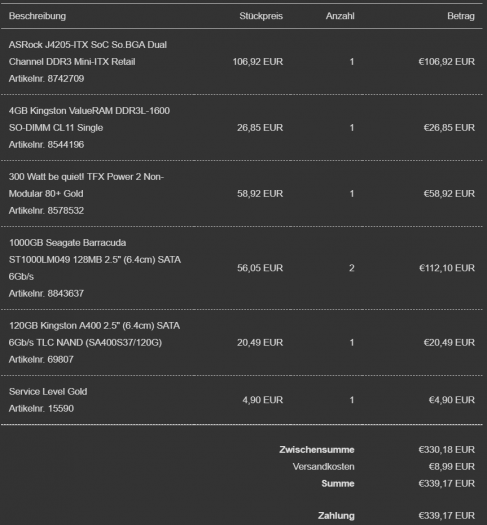 Just ordered a new RockPro64 and the NAS case. I ordered directly form Pine64 and it’s getting shipped from China so it’ll be a while getting here. I figure I won’t have all the parts for about 3 or 4 weeks. I’ll let you know when it all comes in so you can build an image. I’m starting to warm up to Pine64 a bit more (as a company to trust), as they seem to be reaching out to the Linux community more. They’ve made several recent gestures of goodwill in various forums (and they were at this year’s FOSDEM), which have impressed me. Of course, time will tell what they actually deliver, and not just promise. They seem genuinely interested in listening to the needs of Linux users like us. I think they see how crucially important that community support is to the Raspberry Pi, so they want to similarly build a community if they can. Dear Pine64, if you’re out there listening, I beseech you to make upstream contributions to the Linux mainline kernel, to make all your boards work silky smooth in distros like Armbian. That’ll get the Linux geeks running in droves to your boards. I’m not asking for more difficult things like hardware accelerated graphics in a Desktop environment. Just any and all drivers that a headless Nextcloud server would want to use, especially related to Storage I/O, Network I/O, CPU throttling, temperature sensors, etc. You know, server stuff. For example, here’s one such nasty bug, currently. And here’s another. There’s a dedicated thread about running Nextcloud on the RockPro64 over on the Pine64 forum. By posting your experiences there, you might attract advice, etc. from that community. I think it’s also worth noting that the Rock64 is officially “Supported” by Armbian, but the RockPro64 is one step down from that, called “Suitable For Testing (Work In Progress)”. The Rock64 only quite recently graduated from “Suitable For Testing (Work In Progress)” to “Supported”. These designations act as quite a reliable vetting, IMHO. I’m a bit more conservative than most, and try to stick to the “Supported” ARM boards. Yep, I’m aware of that thread. I will update once I’ve gotten my RockPro64 and testing NCP with it. I used Armbian on my Rock64 before it graduated to “Supported” and it worked fine. I plan on doing the same with the RockPro64. I’ll also be sending feedback and any troubleshooting needed to assist the Armbian team as needed to move the RockPro64 to “Supported” status. Good news. WRT the nasty PCIe bug (for the RockPro64) I linked to above, there is active kernel development by a user on the Pine64 forum called ‘Mrfixit2001’, and he’s stated he will push his kernel fixes back upstream into github. Without rock-solid PCIe support, then the RockPro64 isn’t really any more compelling than a cheaper Rock64, IMHO, since in both cases, USB 3 is (currently) all you’ve got to attach some faster bulk storage to (for use with Nextcloud). @nachoparker, I got all my parts for the RockPro64 and should have some time this weekend to put it all together. I’ll give your image a try and let you know how it goes. Some questions in the meantime. I guess I’ll have to manually edit the fstab file to set up the two hard drives connect to the SATA card, right? The NCP apps don’t support SATA drives yet, correct? Thoughts on what filesystem to create? I’ll have two 8TB drives attached. Probably not going to set up a Raid system, but just use something like Rsync to “backup” the data drive to the second disk. Can I use the built in NCP tools for doing backups, or will I have to roll my own? I always recommend BTRFS, if you use the wizard or ncp tools to format USB that’s the default. Sorry, not clear with my question. What I meant to ask was do the native tools (Formatting disks, configuring and managing backups, etc) support SATA drives, or should I have to do those tasks on my own. I do know that I can use a SATA drive with NCP as I have a Popcorn Hour Transformer setup as my main NCP server now. I’ll download the new image before I set up my RockPro64. all that for less than 200$ and its damn fast secure klick link for images. I’m trying to compile a list of “Oldie but Goodie” Mini-Tower PCs over here. Such PC’s would also run Nextcloud well, as Nextcloud is lightweight enough to run on PC’s about 8 years old. Do you know something about consumption of this box? Point to use ARM is lower Power consumption.